Add a small portion of each colored drink to 7 small prep bowls. Remove Zoku™ Quick Pop Maker from the freezer. Using a food syringe or the Zoku™ syphon, take about 1/4 ounce (1-1/2 teaspoons or so) of the red drink and squirt it into the first mold. Repeat with the other two molds. Allow the red layer to freeze completely before moving on to the next color. Repeat the step for each of the next colors, in this order: orange, yellow, green, blue, dark blue and purple. Be sure to allow each layer to freeze completely before proceeding with the next. 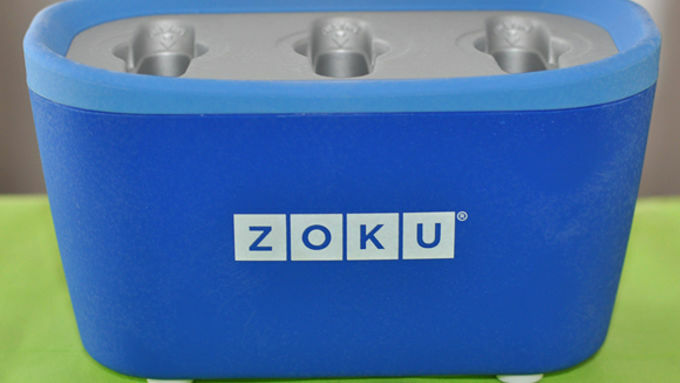 For the final purple layer, fill to the fill line of the Zoku™ molds. Allow to chill on the counter until the pops are entirely frozen solid, about 7 minutes. Use the Zoku™ removal tool to remove the pops from the maker. Enjoy your colorful-licious treat! Rainbows here, rainbows there, rainbows freakin' everywhere! And lookie here -- we've even got 'em in our freezer pops. By now, you Tablespoon regulars know that rainbows get us all giddy pants over here. I'm not kidding. They really do. We actually have meetings where we talk about what food we'll colorize next. I know -- it's a tough job but, hey, some rainbow lover's gotta do it. (Hand in the air: Me! Me! Pick me!) 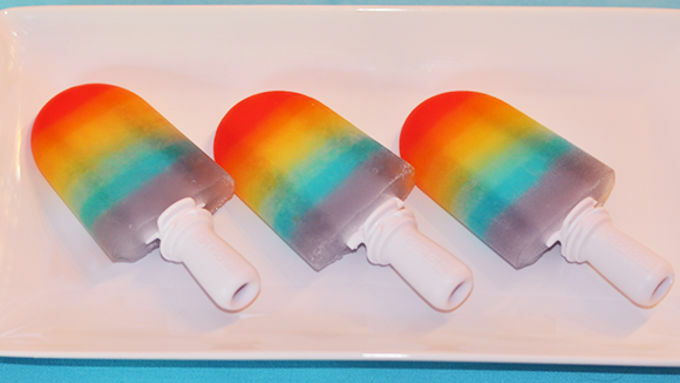 So here's the latest from the Tablespoon rainbow idea vault: freezer pops! We've done Zoku pops before. (Like these, and these, and even these.) 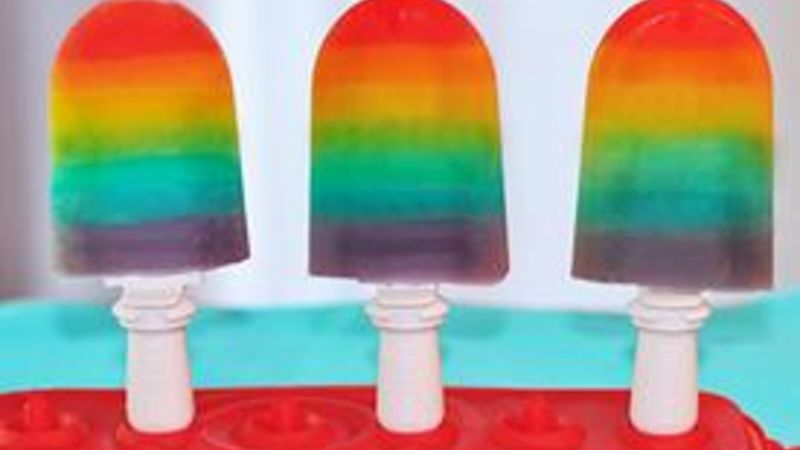 But THESE Rainbow Zoku Freezer Pops are the bestest yet. FROZEN RAINBOWS! How COOL is THAT?! Happy end of summer, everyone!